It struck me as odd that Heavenly Father, Jesus Christ and the Holy Ghost were described as “entities” rather than as “Gods.” It looked to me like the information in this sidebar was supplied by the LDS Church. In fact, at the bottom of the box the newspaper had helpfully supplied a link to the official LDS web site intended for non-member investigators of the Mormon faith, mormon.org. 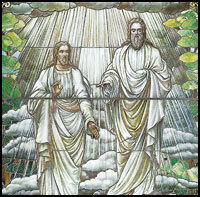 As I explored the mormon.org web site further, I couldn’t find any explanation that Jesus Christ and the Holy Ghost were recognized within Mormonism as Gods; only Heavenly Father was identified as a God. Following this paragraph on lds.org is a short definition of each member of the Godhead; again only the Father is identified as a God. The Cincinnati Enquirer article, typical of many articles I’ve seen, suggested traditional Christianity rejects Mormonism because Mormons believe Jesus visited America and because Joseph Smith claims he was visited by an angel. I’m sure these concerns appear fairly minor to most people. Many never get a glimpse of the bedrock separator between Mormonism and Christianity: one true God vs. many true Gods. We can argue till the cows come home about whether the Christian Trinity or the LDS Godhead is the true representation of God/the Gods as He/They really is/are, but what is really disturbing me about this is the avoidance of the LDS Church in publicly stating — clearly and candidly — what it really believes and teaches about the nature of its Gods. Since a foundational and essential doctrine of traditional Christianity is the belief in and worship of one true God, the LDS doctrine of belief in three true Gods for this world and worship of at least two of them constitutes a very critical distinction. If this doctrinal divergence was more widely known, I think people would recognize and better understand why Christians resist identifying and accepting Mormonism as a Christian faith. That increased foundational knowledge of this difference between Mormonism and traditional, orthodox Christianity would be good for the Christian church, a welcome change. But perhaps such widespread knowledge and understanding about the Mormon Godhead wouldn’t be as welcome within the LDS Church. This entry was posted in God the Father, Jesus Christ. Bookmark the permalink. Sharon thank you for this article. For a long time I have tried to see the difference between mormon and Christian doctrine. This really has helped me to understand an important difference. My daughter and her family are mormon and I will show her this article in the hope that she too can find understanding. This was the “deal breaker” for me when i was exploring whether i wanted to convert to LDS. I think I am one Lucky Guy, I happen to own an 1883 edition of Doctrine and Covenants with the Lectures of faith bound into it, when it was originally part of the D and C.
I believe it was removed from the D and C because the LDS doctrine has changed, and does not line up with the early beliefes. Anyway, my point is, the Lectures on faith taught (ONE GOD) From Eternity, not 3 seperate gods,Lectures pg 22-23. For I AM GOD, and their is none else. So it seems God forgot, his father before him was/is a god, his son and the Holy Spirit are gods and as Joseph smith taught, in the King F, Discourse their are millions of gods. How could God not know this? This all strikes me as very interesting, especially Rick B’s examples from the Lectures of Faith. If you’re LDS, how do you offer a competent rebuttal when there is plain evidence shooting down your argument coming from your own church? On the issues that Rick brought up there is a great article by esteemed Mormon historian and author Thomas G. Alexander. He wrote it when “Professor of History and Associate Director of the Charles Redd Center for Western Studies at Brigham Young University”. It’s a great article and I recommend that everyone read it. Sharon: but what is really disturbing me about this is the avoidance of the LDS Church in publicly stating — clearly and candidly — what it really believes and teaches about the nature of its Gods. Hehe. The fact is that the LDS Church has no formal systematic theology. Rather, what we have is a collection of sacred texts. Latter-day Saints aren’t confused about this. Correctly understanding the Bible, and basing beliefs about the nature of God, Jesus, and the Holy Ghost on the Bible rather than on the creeds, Latter-day Saints understand that the Godhead consists of three separate beings, two of whom have a resurrected physical body, and one of which (the Holy Ghost) is a being of Spirit so that he can dwell within each person. The Godhead is one God in purpose — with Jesus resolved entirely to do the will of the Father in all things — but consisting of three separate beings. Because of this correct understanding of the Godhead, Latter-day Saints can confidently speak of Jesus being the Son of God in a real sense, and understand humanity’s relationship with God better, which includes a more correct understanding of the nature of humanity and the purpose of life. One thing is certain, Latter-day Saints do not believe that people are damned to hell or chosen to be saved before they are born and with no choice of their own. Since Latter-day Saints believe that God the Father really is our Heavenly Father, and that human beings are the same species as God, as taught by the Bible, it is no wonder that free agency/free will is so central to the beliefs of Latter-day Saints. John, I think you are missing the point here. The blog entry was not to show that LDS leaders are confused about what they teach. In fact, it is quite the opposite. The article was to highlight the issue that the church tends to tell half truths and continues to make ambiguous statements. This is a perfect example of the vague answers church members/leaders/missionaries give when asked direct specific questions like this. You can become like God how? In what way? I don’t think this is an issue of being confused, but more so an issue of not being entirely honest and forthright with LDS teachings. John, according to the LDS faith, would it be safe to say that Jesus is a god apart from his father? Would it be safe to say that the Holy Ghost is also a god apart from Jesus Christ and Heavenly Father? Would it be safe to say that they are three entirely different and separate gods who make up one Godhead? Eric Hoffman: The article was to highlight the issue that the church tends to tell half truths and continues to make ambiguous statements. Making ambiguous statements does not in any way mean that someone is telling a half truth. Uncharitably ascribing motives to others like that is not going to score you any debate points. The Bible along with out other sacred texts make several statements that can be hard to rectify concerning the Godhead/Trinity. The three members of the Godhead/Trinity are sometimes referred to as one God and at other times described as separate persons. Creedal Christianity has struggled with this issue for thousands of years with some people pushing toward modalism on one side of the debate (which is considered heresy) and others leaning toward tritheism on the other side of the debate (which is also considered heresy). So there is some mystery about God still — but who among us is surprised by that fact? I am a member of the LDS faith, and I don’t see the confusion that I believe the author is trying to illustrate. For me, believing that the Father, the Son, and the Holy Ghost are three separate beings seems obvious from a scriptural sense, no better illustrated than at Jesus’ own baptism. Now, to the author’s point, were I to say they are all three Gods depends on the connotation of the word gods. To call them gods plural for some people implies a sense of wiccan orthodoxy, as if I pray to one god in the winter, another in the summer, and so forth. I believe when I pray to God I am talking with my Heavenly Father. I believe Christ has risen above all and is a resurrected perfect being, a God. I don’t believe that means He now replaces his Father, God has given Him a different role. I also believe that through the atonement of Jesus I can overcome sin and become perfected through the resurrection as well. I don’t believe that means I’m trying to usurp God’s throne or downplay the role of my Savior, since it’s only through His sacrifice that I CAN overcome sin. Honesty is certainly a required trait (and calling for it also implies that works matter). Latter-day Saints are entirely honest with investigators when they tell them that Latter-day Saints believe that the purpose of life is to return to live with God and indeed to become like God. There is no obfuscation on this point. Evangelical Calvinists, on the other hand, should begin to take an honest approach when preaching their Gospel. Innuendo and implication should be jettisoned for straight talk. What does the disproportional emphasis on certain proof-texted verses from Paul really mean for humanity? What does it mean that billions of people were born and died in Africa, India, China, and other places in the world untouched by Christianity until only very recently? What does it mean that only Europe enjoyed Christianity for much of the last two millennia? Rejecting free will and embracing the predestination of dark Calvinism has its consequences. A little honesty about what this actually means for the majority of people ever born or to be born on this earth is called for. But for those already saved because God chose them to be saved before they were ever born, the sin of lying or dishonesty can not conceivably be much of an issue. A discussion of Calvinism is clearly off-topic. Please get the conversation back on topic. In the Book of Isaiah we read God saying, I KNOW OF NO OTHER GODS. How can He say that their are no other Gods but Him, if their are other gods. I know many LDS try and say, what that verse really means is, God the father is saying, there are no other gods us humans can worship or have anything to do with. But that is not what God said, He clearly says, I KNOW OF NO OTHER GODS, Not their are no other gods you can follow or worship. We read in the Bible that Satan was kicked out of heaven for trying to be like God and trying to exalt himself above God. You are right! And that is the trinity. Three seperate persons make up ONE GOD. Eric: You are right! And that is the trinity. Three seperate persons make up ONE GOD. Excellent. We have found more common ground then. Well, in reality not even close. I don’t think there are three gods controlling this universe. On the other hand, you do. Actually, before I make any possible accusation on what you believe, Geoff; perhaps I should ask you. Does the trinity consist of three gods? It’s a matter of semantics isn’t it Eric? Certainly scriptures tell us that there are three divine persons who make up the “one God” that is the Godhead/Trinity. Don’t you also refer to them God the Father, God the Son, and God the Holy Ghost? Or are you a modalist/Sabellianist? Imagine approaching the Bible with the liberty to read it without the limiting lens of the trinitarian creeds. The Godhead — God the Heavenly Father, His Son Jesus Christ, and the Holy Ghost — is in the Bible; the philosophical Trinity as defined beginning in the fourth century in the creeds is not. When reading the Bible without restricting oneself by the creeds — that is, reading the Bible without forcing the words of the Bible into the concept of later-created creeds — is very enlightening. Latter-day Saints, as Eric well knows, believe that becoming like God means participating with Him in the creative process in the future. Eric also knows of the much speculation that this has generated among Latter-day Saints about what exactly that means. One thing remains certain, God remains God and will always be sovereign to all of us. By choosing to accept Jesus Christ, men and women can open their hearts to the saving power of the Atonement. By being baptized by someone holding the priesthood found in the Church of Jesus Christ of Latter-day Saints, one is cleansed from sin. Only through the Atonement can a person become a being that is cleansed of sin and capable of dwelling in God’s presence. Now, Eric, assuming you are someone who has judged yourself as saved based on accepting Christ in your heart, what do you believe you will be doing for eternity? This provides further evidence to this entire blog entry’s claim of LDS not being completely forthright with their beliefs. When asked direct questions that simple “yes or “no’s” will clearly answer, LDS continue to spin into the cosmos of ambiguity. I will ask you again, Geoff. This time let’s pretend you are answering a simple true of false question on some type of questionnaire. Jesus Christ is a separate god apart from his father. Jesus Christ is a god who was created by his father. Let me make an example here of how to answer a question with clear and precise words. First off, I did not judge for myself whether or not I am saved. Jesus Christ promised me in His word. I will be in fellowship amongst my brothers and sisters in Christ, forever giving praise to God and enjoying his eternal glory and love. I will sing praises to His name and giving worship to His glory. But hey, I would be just fine being a doorkeeper there. God is good!! Clear answer? I don’t know what it has to do with this article though. I see you make attempts to derail topic quite a bit, John. Matt 24:11 And many false prophets shall rise, and shall deceive many. Mk 13:22 For false Christs and false prophets shall rise, and shall shew signs and wonders, to seduce, if it were possible, even the elect. May God give you wisdom to understand the truth and eyes to see the many false creeds and prophets of our time. Sounds like a long eternity. Have fun with that. The post accuses Latter-day Saints of dishonesty. Latter-day Saints are not being dishonest in saying that the three members of the Godhead are three separate entities. That is what Latter-day Saints really believe — that God the Father is a separate being with his own physical body, as is His Only Begotten Son, Jesus Christ, and that the Holy Ghost is a separate being with a body of Spirit so that he can dwell within each person. It is unclear why this is being construed as obfuscation, dishonesty, or derailment of a blog thread. Wrong. I simply see theological nuance where you see none. That is a matter of discernment (or lack thereof); not a matter of forthrightness. If you are trying to show that I don’t believe exactly the same things in the same way that you do you won’t find any arguments from me. I do however believe God and the Bible. As for your true or false questions; I persoanlly see them as more evidence of what appears to be a remedial and ham fisted variety of Christian theology but I’ll take a whack at answering them anyway. It sort of depends on what you mean. If you mean that Jesus could be God without being “one” with the rest of the Godhead then my answer is “false”. If you mean that Jesus has a separate resurrected body and an individual mind that nevertheless freely chooses oneness with the Godhead then my answer would be “true”. Depends on what you mean by “created”. If you mean that the Father is in one way or other the creator of the mortal body of Jesus then my answer is true. If you mean that the Father created Jesus or anything at all ex nihilo then my answer would be an emphatic “false”. WOW!!! May God open your heart a fill it with something other than your lack of respect for our God. Good luck with your creating your own world with people who don’t want to worship you. “LOL”. d allison: It is an interesting FACT that the Bible has more warning(s) about the mission of false prophets than any other demonic counterfeit. But what you are not seeing here is the fact that Mormon officials clearly choose to use words like “entities” rather than “gods” because that hides the possibility of polytheism. Most of the secular world is aware that Christians believe in only one God. John, you must admit that there is a language barrier that must be scaled when talking to Mormons. According to Mormon theology “Entities”=”gods” when describing the Godhead…Am I correct? But, to the potential convert who is under the false pretense that Mormonism is a Christian denomination and who is unaware of the language barrier, things can be misleading. When I started to study the LDS faith, I requested LDS Missionaries to come visit my wife and I. I knew little of your doctrine and was curious of why the body of Christ rejected Mormonism as a part of it. According to Mormon theology, the Godhead consists of only One God. But it is also considered appropriate to refer to the Father, the Son, or the Holy Spirit as “God”. Our scriptures do that at times as well. So let me ask you this: On your view is the God the Son really God? Is God the Father really God? Is God the Holy Spirit really God? If so how do you go about rectifying this issue? One God huh? Click Here. Make sure you read the third paragraph aloud to yourself. I rectify the the issue here…Genesis 1:1; Deuteronomy 4:39; Nehemiah 9:6; Psalm 96:5; Isaiah 40:12-20; 43:10; 44:6, 8, and 24; Jn. 1:1-3; and 17:3. 1He is the image of the invisible God, the firstborn over all creation. For by him all things were created: things in heaven and on earth, visible and invisible, whether thrones or powers or rulers or authorities; all things were created by him and for him. He is before all things, and in him all things hold together. And he is the head of the body, the church; he is the beginning and the firstborn from among the dead, so that in everything he might have the supremacy. Are you avoiding my questions? Simply listing scriptures is not answering my question. I’ll make it easier for you by paring the question down: On your view is the God the Son really God or not? By the way Eric, I am very familiar with that sermon by Joseph Smith. As I just said God the Father, God the Son, and God the Holy Ghost could be referred to individually as God or the perfectly unified Godhead could be called the one God. I did not know that giving you the word of God would not suffice for you. The Son is God, yes! That link I gave you does not coincide with your statement. You seem to like the latter when open to the public. But inside those temples, it’s the former. I think we are abusing the blog for us to get off topic and dialogue amongst ourselves. Would you be willing to do this over a phone call? I can shoot you my number in an email. Or you can check out our website and get contact info there. What do you say, Geoff? You seem to be implying that there is some massive difference between our views on the Godhead/Trinity. But unless you are a modalist I don’t see it. We both agree that the Godhead/Trinity is composed of three divine persons. You just said “The Son is God, yes!” so I assume that means you also think the Father and Holy Spirit are God too. So each person in the Trinity is able to be called God individually in both of our views. Whether you call that “three Gods” or three divine persons that can be called God is simply semantics. We agree that when combined they comprise what the scriptures call the one God. So where is the difference you are seeing? Are you a modalist after all or something? Forgive me if ive lost track of all the arguments, but can anyone, LDS or otherwise explain Mosiah 14? It seems that Jesus is described as first the Son, then the Father, and then the Spirit. Wouldn’t this imply that they are the same god? Maybe Christian trinitarian doctrine should say the Trinity is one God with 3 parts, and LDS could have the Godhead is 3 Gods who make up one part? Maybe i just havnt slept in far too long and im rambling. So where is the difference you are seeing? “The Father has a body of flesh and bones as tangible as man’s” Doctrine and Covenants 130:22. Compare with Alma 18:26-27; 22:9-10) “Therefore we know that both the Father and the Son are in form and stature perfect men; each of them possesses a tangible body . . . of flesh and bones.” (Articles of Faith, by James Talmage, p. 38). God is a trinity of persons: the Father, the Son, and the Holy Spirit. The Father is not the same person as the Son; the Son is not the same person as the Holy Spirit; and the Holy Spirit is not the same person as Father. They are not three gods and not three beings. They are three distinct persons; yet, they are all the one God. Each has a will, can speak, can love, etc., and these are demonstrations of personhood. They are in absolute perfect harmony consisting of one substance. They are coeternal, coequal, and copowerful. If any one of the three were removed, there would be no God. A further point of clarification is that God is not one person, the Father, with Jesus as a creation and the Holy Spirit is a force (Jehovah’s Witnesses). Neither is He one person who took three consecutive forms, i.e., the Father, became the Son, who became the Holy Spirit. Nor is God the divine nature of the Son (where Jesus had a human nature perceived as the Son and a divine nature perceived as the Father (Oneness theology). Nor is the Trinity an office held by three separate Gods (Mormonism). The idea of a composite unity of persons is spoken of by God in Genesis (Gen. 2:24). Notice the change from added words, Jesus went from being God the father to (a) god. that the Lamb of God IS THE ETERNAL FATHER, and the SAVIOUR of the world. Is the teaching of the LDS Church today consistent with that of the early 1830’s? If the Mormon Church’s claim to be the “only true church on earth today” is to be believed, one would expect consistency in teaching from the beginning until today. However, based on the earliest works of the Church of Jesus Christ of Latter-day Saints (then “The Church of Christ”), the answer to the above question is an emphatic no. Since the first version of the Book of Mormon was published (1830), an evolution of theological thought can be clearly traced. A departure from the monotheistic view established with the B.of M. can be traced to the 1851 version of the Pearl of Great Price. So when did the doctrines in these important areas change to present day LDS beliefs? In the middle to late 1830’s Joseph Smith’s beliefs about God changed tremendously. He developed the concept that “God was once a man.” This great swing in belief created a ripple affect in the Mormon concept of the attributes of God. So where does one turn to determine the very character of God? Does one stand with the beliefs of the LDS Church in the early 1830’s, or does one stand with the attributes of God as presented by the current church doctrine? And if God were to have chosen Joseph Smith to be a prophet, why would that prophet teach such utterly contradictory concepts of God within the space of less than twenty years? The Christian doctrine of the Trinity is simply not biblical. When one truly internalizes the doctrine of the Bible (both the local and global context), it becomes obvious to an objective reader (objectivity is extremely rare in Christendom) that the LDS (Mormon) understanding of the Godhead is the only correct interpretation. The Bible is NOT monotheistic as claimed by orthodox Christianity…the Bible espouses the doctrine of monolatry, which is the worship of one God, without claiming he is the only god. Here, let me give you an example: From Isa 44: 8 …Is there a God beside me? yea, there is no God; I know not any. No one stepped forward to say “That’s false!” This is 1844, so 15 years previously goes back to 1829. Lastly, the BofM (1829) teaches LDS doctrine about the Godhead, including a plurality of gods, the oneness of god, and the exaltation of men (3 Nephi 28:10-11). Stop reading the critics who love to sensationalize, but withhold the truth. From 1829, and worst case 1832, we have the explicit and modern doctrine of LDS theology taught in the Church. There are more pink unicorns in the Book of Mormon than there are instances where the plurality of gods is taught. Heck, you can count more steel swords that were used in the pre-Columbian New World.